Rabindranath Tagore (Bengali: রবীন্দ্রনাথ ঠাকুর) (7 May 1861 – 7 August 1941) was a Indian poet of India. His name is written as Rabindranath Thakur in Indian languages. He was also a philosopher and an artist. He wrote many stories, novels, poems and dramas. He is also very well known for composing music. His writings greatly influenced Bengali culture during the late 19th century and early 20th century. In 1913, he won the Nobel Prize in Literature. He was the first Asian ever to win this prize. Tagore was popularly known as "Gurudev." His major works included Gitanjali (Song Offerings), a world-famous poetry book; Gora (Fair-Faced); Ghare-Baire (The Home and the World); and many other works of literature and art. Tagore was also a cultural reformer, and modernized Bangla art. He made it possible to make art using different forms and styles. Tagore died on 7th August 1941 ("Baishey Shrabon" in Bengali 22nd Shrabon). Tagore was born in the city of Kolkata (formerly called Calcutta), at No. 6 Dwarkanath Tagore Lane, Jorasanko Thakur Bari. He was the youngest of his parents' 14 children. His father was Debendranath Tagore; his mother was Sarada Devi. Tagore was a Bengali Brahman by birth. His nickname was "Rabi" or "Robi." Tagore wrote his first poem when he was only eight years old. In 1877, when he was 16, Tagore published his first large poetry collection. Also when he was 16, he wrote his first short story and dramas. In February 1873, at age 11, Tagore went with his father on a tour of India. The tour lasted several months. They visited many places in India, including Amritsar in Punjab, and Dalhousie in the Himalayas. Tagore also visited his father’s estate at Shanthiniketan. There he read biographies, and studied history, astronomy, modern science, and Sanskrit. He also read works by Kali Das. During this time, Tagore also composed many literary works. One of them was a long poem in Maithili (the language spoken by the people of Mithila, India). Tagore wrote this poem in the style of Vidyapati, a famous poet who wrote in Maithili. In 1878, Tagore went to London. He enrolled at a public school in Brighton, England. He wanted to become a barrister. Later he studied at University College London. But in 1880, after Tagore did not do well in school, his father called him back from London. His father arranged a marriage for him with Mrinalini Devi, a girl who was just ten years old. They got married on 9 December 1883. Together they had five children, but two died during childhood. In 1901, Tagore left Sheildah. He went to Shantiniketan (West Bengal) to build an ashram (which is like a monastery in Indian religions). In English, "Shantiniketan" means "an abode [place] of peace." He built a prayer hall, a school, and a library. He planted many trees and built a beautiful garden. 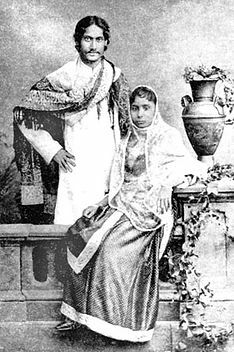 Tagore's wife and two of his children died in Shantiniketan. On 19 January 1905, Tagore's father also died. By this time, Tagore had started receiving monthly income as part of his inheritance. He also started receiving some royalties for his literary works. He was very popular among readers of the Bengali language, as well as other people who knew his works through translations and reviews. On 14 November 1913, Tagore won the 1913 Nobel Prize in Literature. The Swedish Academy had selected him based on a small amount of his translated works, and his 1912 work of poems named Gitanjali: Song Offerings. The British Crown gave Tagore a knighthood in 1915. However, he gave back the title in 1919 to protest the Jallianwala Bagh Massacre in Amritsar. During this massacre, troops of the British Raj killed people who had no weapons. In 1921, Tagore and an agricultural economist named Leonard K. Elmhirst set up the Institute for Rural Reconstruction in a village named Surul, near Tagore's ashram at Shantiniketan. Tagore recruited many scholars and officials from many countries to help the Institute. Its goal was to use schooling to "free village[s] from ... helplessness and ignorance." In the early 1930s, Tagore also grew more concerned about India's "abnormal caste consciousness" and differences based on castes. He lectured on the evils of such practices, and also wrote many poems and dramas on these themes. He also became an activist. He worked to get Dalits allowed into Kerala's Guruvayoor Temple. Dalits were the lowest social class in India. They were not allowed to do many things – for example, they could not go into Hindu places of worship. Even during the last decade of his life, Tagore continued his activism. He criticized Mohandas Gandhi, the Indian leader, for Gandhi’s comments about an earthquake on 15 January 1934 in Bihar. Gandhi had said the earthquake had happened because God wanted to punish people for practicing casteism. Tagore also wrote a hundred-line poem about the poverty in Kolkata. Later on, Satyajit Ray based one of his movies on this poem. During this period, Tagore wrote fifteen volumes of prose-poems. They covered many parts of human life. In his last years, Tagore took an interest in science, and wrote a collection of essays. These essays explored biology, physics, and astronomy. Tagore spent the last four years of his life in sickness and pain. In late 1937, he lost consciousness. He was in a coma for a long time. Eventually he woke up, but three years later, he went back into a coma. During these years, whenever he was conscious and felt well enough, he wrote poems. These poems talk about how he came close to death. After a long period of suffering, Tagore died on 7 August 1941, at the age of 80, in his childhood home in Kolkata. During 1878 and 1932, Tagore visited thirty countries on five continents. His goal was to make his literary works known to people who did not speak Bengali. He also spread his thoughts and ideas, including his political ideas. In 1912, Tagore went to England. Anglo-Irish poet William Butler Yeats wrote the preface to the English translation of Tagore's famous book Gitanjali (Song Offerings). Tagore also met Ezra Pound, Robert Bridges, Ernest Rhys, Thomas Sturge Moore, and many others. 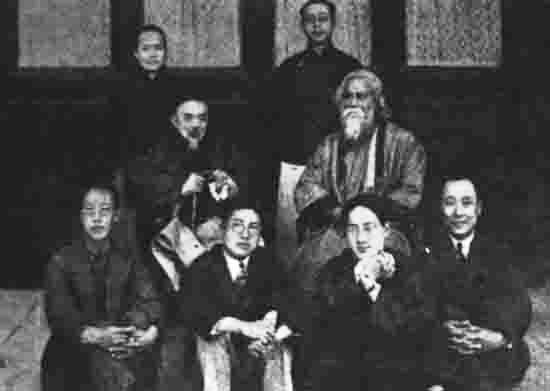 From May 1916 until April 1917, Tagore gave many lectures in Japan. Shortly after returning to India, the 63-year-old Tagore visited Peru at the invitation of the Peruvian government. At the same time, he also visited Mexico. Both governments pledged donations of $100,000 to Tagore's school at Shantiniketan. On 30 May 1926, Tagore reached Naples, Italy. The next day, he met fascist dictator Benito Mussolini in Rome. On 20 July 1926, Tagore criticized and spoke out against Mussolini. In July 1927, Tagore and two friends went on a four-month tour of Southeast Asia. They visited Bali, Java (island), Kuala Lumpur, Malacca, Penang, Siam, and Singapore. Later on, Tagore wrote a book named “Jatri” (The Traveler) about his experiences during these trips. In early 1930, Tagore left Bengal for a nearly year-long tour of Europe and the United States. In Paris and London, there were displays of his paintings. During this period, Tagore wrote his Hibbert Lectures for the University of Oxford. He also met Aga Khan III. From June to mid-September 1930, Tagore toured Denmark, Switzerland, and Germany. Next, he toured the Soviet Union. Tagore's travels gave him opportunity to talk with many notable persons of his time. They included Henri Bergson, Albert Einstein, Robert Frost, Mahatma Gandhi, Thomas Mann, George Bernard Shaw, H.G. Wells, Subhas Bose, and Romain Rolland. Tagore's last trips abroad were his visits to Iran and Iraq in 1932, and to Ceylon in 1933. He visited Iran as a personal guest of Shah Reza Shah Pahlavi. People know Tagore mainly as a poet. But his literary works include novels, essays, short stories, travelogues, dramas, and thousands of songs. He was also an expert painter. Many movies also have soundtracks featuring selections from Tagore's songs, Rabindra Sangeet. Tagore also wrote many non-fiction books. These covered many subjects, including the history of India, linguistics, essays and lectures, details of his travels, and other autobiographical things. In 1917, Tagore published a book called My Reminiscences. In this book, Tagore gives credit to his friend and mentor, Akshay Chowdhury, for influencing him in literature since he was a child. Akshay was the youngest son of Mihir Chandra Chowdhury, whose ancestry linked with the Dutta Chowdhury (Chowdhuries) family of Andul. Rabindranath used to call Akshay as Akshay Babu. Akshay Chowdhury, Romesh Chandra Dutt, and Jyotiridranath Tagore were classmates during Hindu School in Kolkata. Because of this, Ashkay developed a strong, friendly relationship with the Tagore family. Rabindranath wrote that he loved to discuss high-level literature in detail with "Akshay Babu." 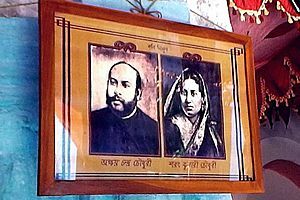 At times, Akshay and his wife, Sarat Kumari Chaudhurani, used to participate in long talks about literature in a garden at Thakur Bari. Tagore was also an excellent musician and painter. He wrote around 2,230 songs. People call these songs "Rabindra Sangeet (which means "Tagore Song" in English). These songs are now a part of modern Bengali culture. Tagore's many poems and songs are parts of his novels and stories. His songs and music cover many aspects of human emotion, from devotional hymns to songs of love. In most Bengali-speaking families, people sing Rabindra Sangeet'. Music critic Arther Strangeways of The Observer first introduced Tagore's songs to non-Bengalis through his book The Music of Hindustan. The book describes Tagore Song as a "vehicle of a personality ... [that goes] behind this or that system of music to that beauty of sound which all systems put out their hands to seize." Among Rabindra Sangeet are two great works, which are now national anthems of two different countries: India and Bangladesh. This makes Tagore the only person in the world to have written the national anthems of two nations. They are Bangladesh's Amar Sonaar Baanglaa and India's Jana Gana Mana. Rabindrasangit also influenced the styles of musicians like Vilayat Khan, Buddhadev Dasgupta, and composer Amjad Ali Khan. At age 60, Tagore took an interest in drawing and painting. He used many styles from different parts of the world. His styles included craftwork by the Malanggan people of northern New Ireland, Haida carvings from the Pacific Northwest region of North America, and woodcuts by Max Pechstein. Sometimes, Tagore used his handwriting in artistic styles on his manuscripts. His drawings and paintings were successfully displayed in France and London. When he was only a boy of 16 years, he had performed in a drama organized by his brother, Jyotirindranath Tagore. When Tagore was 20 years old, he wrote a drama named Valmiki Pratibha (The Genius of Valmiki). This described the life of Valmiki, his change from a robber to a learned person, his blessing by goddess Saraswati, and his writing of the Ramayana. Another notable play by him is Dhaka Ghar (The Post Office), describes how a child tries to escape from his confinement, and falls asleep. This sleeping is suggestive of death. This play received reviews in many parts of Europe. In 1890 he wrote Visarjan (Sacrifice). Many scholars believe this to be his finest drama. The Bangla-language originals included intricate subplots and extended monologues. He wrote many other drams on a variety of themes. In Tagore's own words, he wrote them as "the play of feeling and not of action". Rabindra Nritya Natya means dance dramas based on Tagore’s plays. Tagore wrote many stories during the period from 1891 to 1895. Galpaguchchha (Bunch of Stories) is a three volume collection of eighty-four of his stories. Tagore wrote about half of these stories during the period 1891 to 1895. This collection continues to be very popular work of Bangla literature. These stories have been used for many movies and theatrical plays. Tagore drew inspiration and ideas for writing his stories from his surroundings, from the village life of India. He saw the poor people very closely during travels to manage his family’s large landholdings. Sometimes he used different themes to test the depth of his intellect. Tagore's poetry is very varied, and covers many styles. He drew inspiration from 15th - and 16th century poets, as also from ancient writers like Vyasa. Bengal’s Baul folk singers also influenced his style of poetry. He wrote many poems when he was at Shelidah managing his family’s estates. Many of his poems have a lyrical quality. These poems tell about the "man within the heart" and the "living God within". Over the next 70 years, he repeatedly revised his style of writing poetry. In 1930s, he wrote many experimental works of poetry, and also used modernism and realism in his works. "My poet's vanity dies in shame before thy sight. O master poet, I have sat down at the feet. Only let me make my life simple and straight, like a flute of reed for thee to fill with music." Tagore is the only person to have written anthems for three countries . Jana Gana Mana, the national anthem of India, was one of the works of Tagore. Amar Shonar Bangla, the national anthem of Bangladesh, was written by Tagore. Sri Lanka Matha, the national anthem of Sri Lanka, the Bengali version of which was written by Rabindranath Tagore, and was later translated into Sinhala by Ananda Samarakoon, his student. Tagore’s political views were complex. He criticized European colonialism, and supported Indian nationalists. But, he also criticized the Swadeshi movement of many nationalist leaders of India. Instead, he emphasized self-help and intellectual uplift of the masses. He requested Indians to accept that "there can be no question of blind revolution, but of steady and purposeful education". Many people did not like his thinking. In late 1916, some Indians wanted to kill him when he was staying in a hotel in San Francisco, USA. They did not kill him as they started arguing with Tagore, and then dropped the idea to kill him. Tagore also wrote many songs praising the Indian independence movement. He also returned the British honor of Knighthood as a protest against the 1919 Amritsar massacre. In Amritsar, troops of the British Raj had opened fire on unarmed civilians killing many persons. 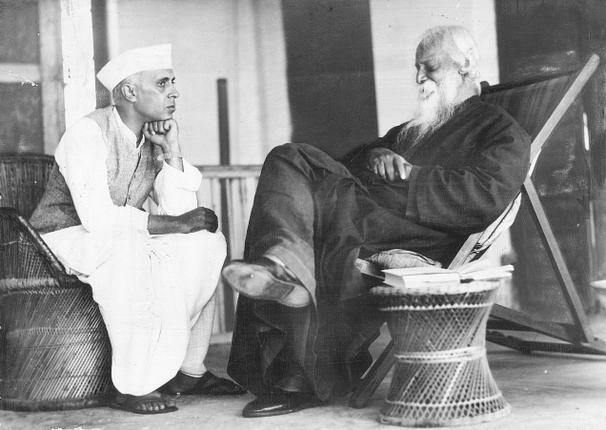 Despite his not very cordial relations with Gandhi, Tagore played a key role in resolving a Gandhi-B. R. Ambedkar dispute involving separate electorates for untouchables. Untouchables were people considered lowest in the social order. Sir Rabindranath Tagore had tremendously contributed for freedom of India as well as freedom of all people throughout the world, and also he identified first time the theme of "Globalization". Tagore was also critical of traditional style of education. While on a visit to Santa Barbara, California on 11 October 1917, he visualized a new type of education. He thought of a new type of university which he desired to be set up at Shantiniketan. On 22nd December 1918, work for building the new university began. It started functioning from 22nd December 1921. He named the university: Visva-Bharati University. Tagore worked hard to raise funds for the university, and toured many parts of Europe and USA for this purpose. He gave all his Nobel Prize monies to this university. The university gave personal guidance to all students. Students lived close to nature, and teacher-student relationship followed a pattern of gurukul system of ancient India. In his own words, he wanted this university to become “a world center for the study of humanity ... somewhere beyond the limits of nation and geography." He also had a dream for the future India. He wanted India’s freedom from the British rule. He dreamt of an India: “Where the mind is without fear”. The annual Bengali festival/celebration of Kabipranam - Tagore's birthday anniversary - held in Urbana, Illinois in the United States. The Rabindra Path Parikrama walking pilgrimages leading from Calcutta to Shantiniketan, and ceremonial recitals of Tagore's poetry held on important anniversaries. Nobel laureate Amartya Sen, who is also a Bengali, once noted that even for modern Bengalis, Tagore was a "towering figure", being a "deeply relevant and many-sided contemporary thinker". Tagore's collected 1939 Bangla-language writings (Rabīndra Racanāvalī) are one of Bengal's greatest cultural treasures, while Tagore himself has been proclaimed "the greatest poet India has produced". He was also famed throughout much of Europe, North America, and East Asia. Translations of his works are available in many languages of the world, including Russian, English, Dutch, German, Spanish, and many others. In the United States, Tagore gave many lectures during 1916 and 1917. Many people attended those lectures. Various composers, including classical composer Arthur Shepherd’s, have set Tagore’s poetry to music. Cover of the Sabuj Patra magazine, edited by Pramatha Chaudhuri. Kala Bhavan (Institute of Fine Arts), Santiniketan, India. Bust of Tagore in Gordon Square, Bloomsbury, London. Rabindranath Tagore's bust at St Stephen Green Park, Dublin, Ireland. The houseboat ("Bajra") of the Tagore family, at Shilaidaha Kuthibadi, Bangladesh. The Morning Song of India. 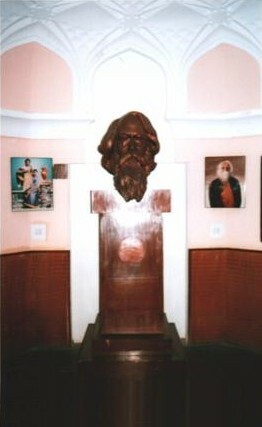 Tagore Room, Sardar Patel Memorial, Ahmedabad, India. Rabindranath Tagore Facts for Kids. Kiddle Encyclopedia.